"The Grand Budapest Hotel" is so picture-book pretty, smartly constructed and thoroughly enchanting that a brief stay there will leave visitors feeling not only satiated and invigorated but possibly even more sophisticated. This charmingly witty wonder may be the most accessible film yet from director-writer Wes Anderson, whose previous deadpan-quirky comedies include "Moonrise Kingdom," "Fantastic Mr. Fox," "The Darjeeling Limited" and "Rushmore." With deliciously refined dialog that sometimes lapses into hilariously unexpected profanity, it's like a classic screwball comedy that's been creatively refurbished without requiring extensive remodeling. It's irresistibly retro, it's intriguingly post-modern, but most of all it's genuinely funny. Most of the movie is an extended three-levels-deep flashback recounted to the writer of a book about the hotel by an elderly former Lobby Boy. Like us, the unnamed author (played by Tom Wilkinson in the character's later years and by Jude Law in a 1968 segment) is fascinated by the colorfully unlikely reminiscences of Zero Moustafa (played by F. Murray Abraham in the 1968 bit, and by Tony Revolori in the 1932 segment that makes up the bulk of the film). 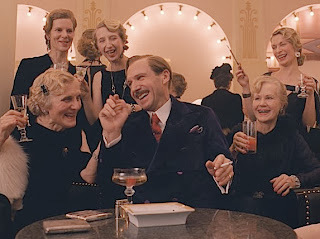 Zero's mentor is the hotel's imperious, supercilious and ridiculously efficient concierge Monsieur Gustave H. (an award-worthy Ralph Fiennes), whom Zero notes is "the most liberally perfumed man I have ever encountered." In addition to overseeing his staff "like a hawk with a horsewhip in his talons," Gustave has a habit of bedding the hotel's older female guests. One of them dies and leaves Gustave a valuable painting, but her indignant son Dmitri (a cartoonishly nasty Adrien Brody) is determined to keep it for himself. Gustave and Zero take matters into their own hands by stealing the painting instead of waiting for the widow's lawyer (the always enjoyable Jeff Goldblum) to make sense of her endlessly modified will. Accused of murder and hunted by onetime hotel guest and current Police Captain Henckels (Edward Norton, echoing his pursuing scoutmaster role from "Moonrise Kingdom"), Gustave and Zero flee in search of a missing witness across the picturesque but fictional country of Zubrowka, which rather inconveniently is descending into fascism. Fiennes' portrayal of Gustave as an unflappably proper and aristocratic gentleman given to occasional obscene outbursts is a delight. His on-the-run odd-couple pairing with Zero, an innocently good-hearted Mideast refugee with a hand-drawn pencil moustache, forms a bond between them that turns unexpectedly touching. The movie's supporting cast is fully booked with additional memorable characters. Willem Dafoe is villainously menacing as Dmitri's violent henchman Jopling. Saoirse Ronan is Zero's girlfriend Agatha, whom Gustave says is "flat as a board, enormous birthmark in the shape of Mexico on her face." Harvey Keitel is a well spoken but badly tattooed prison inmate whose escape map shows surprising artistic skill. Anderson movie regulars Bill Murray, Jason Schwartzman and Owen Wilson also show up in small but amusing roles. Like nearly all of Anderson's films, "The Grand Budapest Hotel" has an elaborate storybook-reality look, as if even the most trivial elements of each scene were lovingly crafted for maximum eye appeal. Memorable settings include the luxurious hotel, an unassumingly unconvincing mountaintop observatory and a prison where the mush apparently is not so bad. The director's signature love of symmetry and sideways camera moves will be familiar to fans, and some stop-motion special effects are so intentionally unreal they manage to be endearing. Highly recommended, this perfectly scrumptious comedy is sure to be on my best of 2014 list.